Gene Tierney in Leave Her to Heaven (1945). 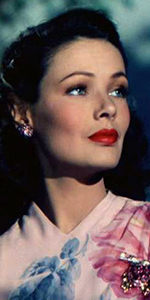 Gene Tierney was a very popular leading lady at the 20th Century-Fox studio during and after World War II. Considered a great beauty, she brought a unique mystery to almost all of her roles. Born to parents of Irish decent, Gene was named after her uncle, who had passed away shortly before her birth. Raised in comfortable circumstances, young Gene was something of a dreamy child, writing poetry and being attracted to the stage at an early age, appearing as Jo in a student production of Little Women. Educated for a few years at a boarding school in Lausanne, Switzerland, Tierney learned French, returning to the U. S. in to attend a private school in Connecticut. A family trip to Hollywood brought her to the Warner Bros. lot where a cousin worked. Meeting with Anatole Litvak, the director who suggested she become an actress, Gene's parents nixed the idea. Gene Tierney was a debutante, but soon became disenchanted with the routine. The Tierney's pointed her in the direction of the stage, where she became a protégée of director George Abbott. She gained much notice in the Broadway plays Mrs. O'Brien Entertains in the 1939 season, and Ring Two in the same year. The Tierney family undertook to finance her bid for movie stardom, allowing Gene to travel out to Hollywood, but she returned to Broadway for The Male Animal in the 1940 season. 20th Century-Fox head Darryl F. Zanuck saw the play and later, saw Tierney dancing at the Stork Club — she was signed to a contract immediately. She was shoved into the Technicolor western The Return of Frank James (which played the Chinese in August, 1940), then gave an unforgettable performance as the half-wit Ellie Mae Lester in Tobacco Road (played the Chinese in March, 1941). She co-starred with Victor Mature in The Shanghai Gesture (played in January, 1942), then co-starred with Tyrone Power in Son of Fury: The Story of Benjamin Blake (played in February, 1942), and Henry Fonda in the comedy Rings on Her Fingers (played in May, 1942), and got top billing in a "guy" movie, Thunder Birds (played in November, 1942). By now, Tierney was an established star. She headlined in the war film China Girl (which played the Chinese in January, 1941), while her turn in the comedy Heaven Can Wait (played the Chinese in August, 1943) not only got her top billing over Don Ameche, but the film was a huge hit to boot. Gene Tierney achieved immortality as the femme fatale in the proto-noir Laura, (which played the Chinese in November, 1944), opposite Clifton Webb. This was followed by her mysterious performance in Leave Her to Heaven (played the Chinese in December, 1946), and became the biggest money-maker for the Fox studio during the 1940s. 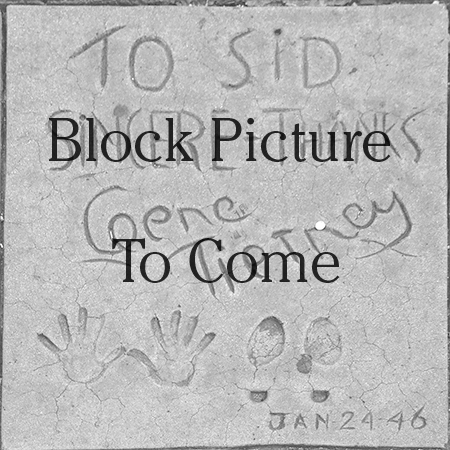 Since Tierney and Sid Grauman were good friends, he asked her to come down to the theatre; they would both make their imprints on the same day. Fox had no shortage of vehicles for their superstar: Dragonwyck (which played the Chinese in April, 1946), The Razor's Edge with Tyrone Power (played the Chinese in December, 1946), The Ghost and Mrs. Muir with Rex Harrison (played in July, 1947), That Wonderful Urge (released in December, 1948) and Whirlpool (played in January, 1950). She did a couple more noirs, Night and the City (which played the Chinese in June, 1950) with Richard Widmark receiving top-billing, and Where the Sidewalk Ends (played the Chinese in July, 1950) with Dana Andrews. Tierney was loaned out to Paramount for the comedy The Mating Season (released in January, 1951), then to Warner Bros. for Close to My Heart (released in October, 1951), with Ray Milland, then back to Fox for Way of a Goucho (released in October, 1952). After that, Fox and Tierney parted company. She starred with Spencer Tracy in Plymouth Adventure (released in November, 1952) at M-G-M, then made Never Let Me Go (released in May, 1953) in England with Clark Gable. While in Europe, Tierney made Personal Affair (released in the U.S. in January, 1954) with Leo Genn, then returned to the U.S. and to the Fox lot to make an early CinemaScope noir Black Widow (released in October, 1954). A heavy smoker, Tierney struggled with depression, and in 1957 had an episode where she considered suicide by standing on a 14th story ledge for 20 minutes. Years of psychiatric treatments did not really do the trick for Gene, who badly wanted to re-integrate into society, but somehow — no treatment seemed to help. She took a part in Advise and Consent (released in June, 1962), and followed up with Toys in the Attic (released in 1963), and The Pleasure Seekers (released in December, 1964). She did only a few television projects, appearing on all the major talk shows, and doing the TV movie, Daughter of the Mind (1969), and the mini-series, Scruples (1980). Married since 1960 to Texas oil man W. Howard Lee, who passed away in 1981, Tierney published her autobiography Self-Portrait, in 1979. She herself succumed to emphysema in 1991, at the age of 70. Grauman's Chinese Theatre, Hollywood, California. Gene Tierney Forecourt ceremony, Thursday, January 24, 1946. 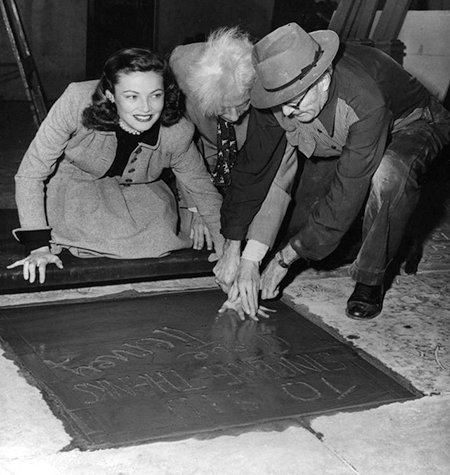 Ms. Tierney has her hand imprinted in the cement by both Sid Grauman, and cement artist Jean Klossner.